While I have only been working in the IBAM office for a few short months, I often hear people get confused with how the licensing system in Manitoba works. I just thought I would take a moment to explain the different levels to you. In Manitoba, there are 4 different General Insurance Licenses that are issued by the Insurance Council of Manitoba (ICM). 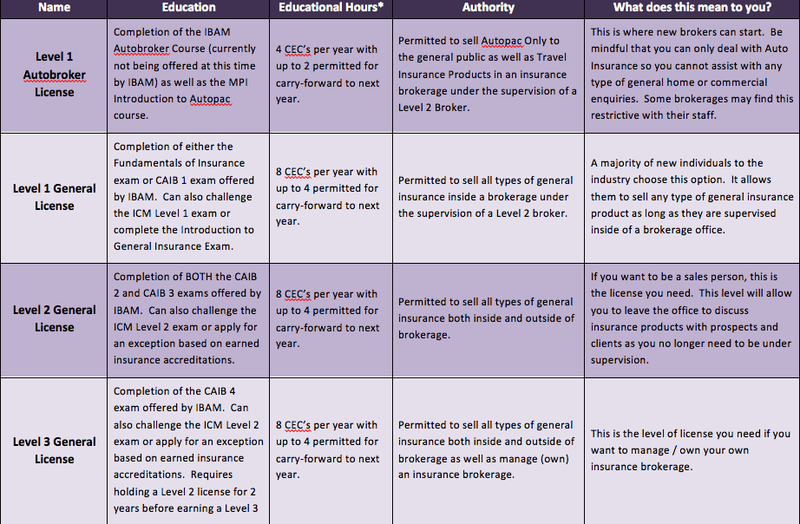 A potential insurance broker must fulfill the required educational steps in order to qualify for a license which means passing an accredited insurance exam. *Note – CEC stands for Continuing Education Credits which are required by your license renewal date of May 31 each year in order to maintain your insurance license. Many brokers may find that they have earned a new license level during the course of the licensing year. This concerns them as most people want their license to be upgraded as soon as they pass the qualifying exam. If you have passed an IBAM course, IBAM always submits the successful marks to ICM who will note the update their system. This will trigger a revised license to be sent to the insurance broker showing their new license level at no charge to the brokerage. For more information on how licensing works in Manitoba, simply contact Katrina at the IBAM office or you can visit the ICM Website at www.icm.mb.ca.